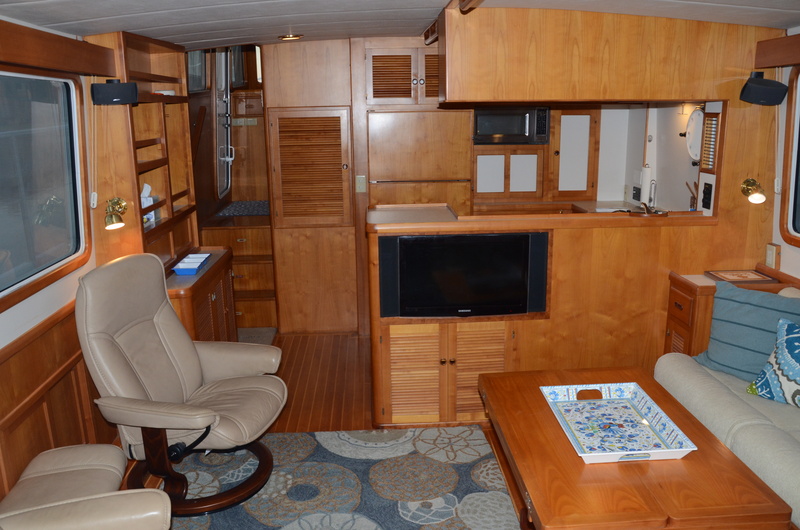 This is a rare opportunity to own a gorgeous, pre-enjoyed Krogen Express 52′ for less than half the price of a new one. 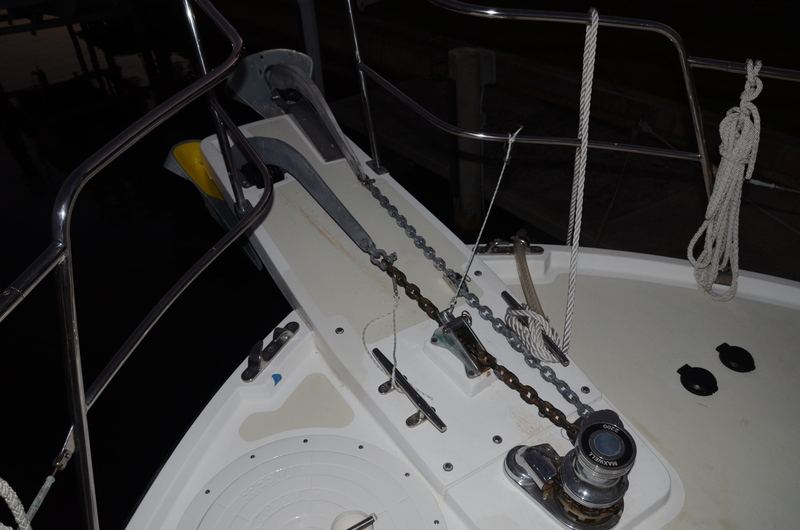 Check out the long list of recent work done to make her mechanically excellent. 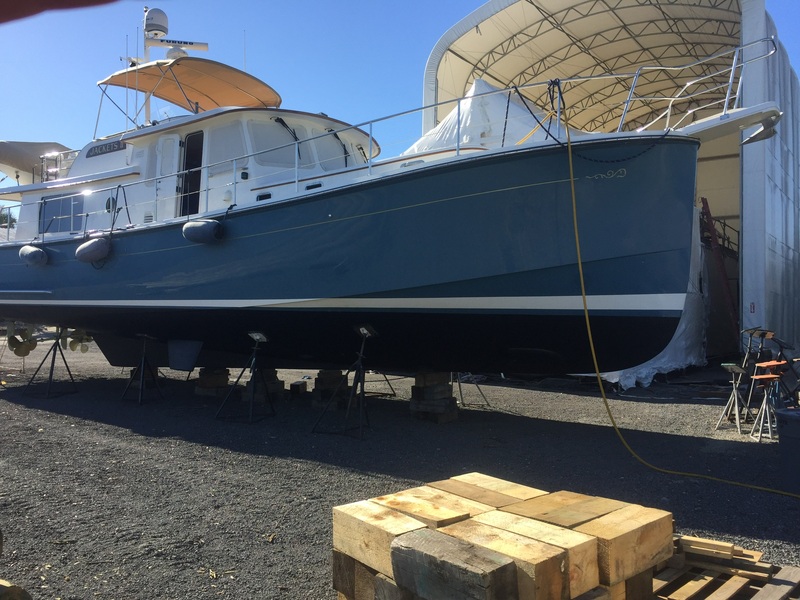 Her port engine is brand new with her most of her 2-year warranty remaining and her starboard engine has been largely rebuilt. 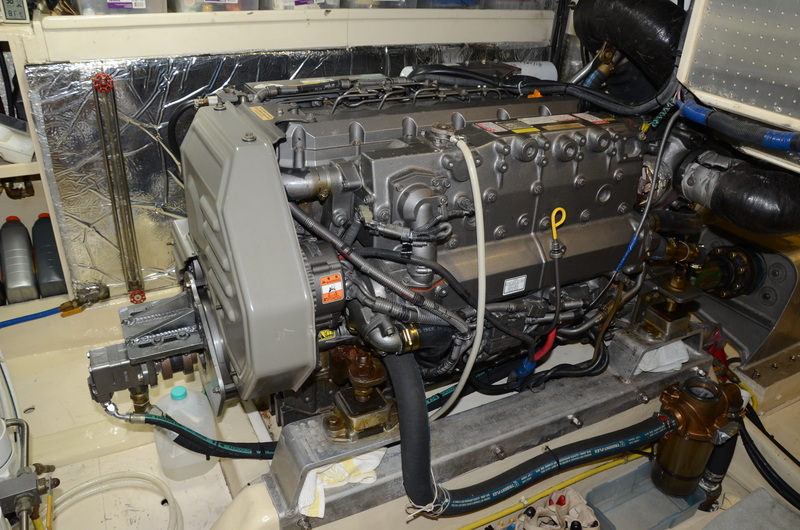 All new air conditioners, water heater, gensets serviced, current Furuno chartplotters factory serviced, and much more. 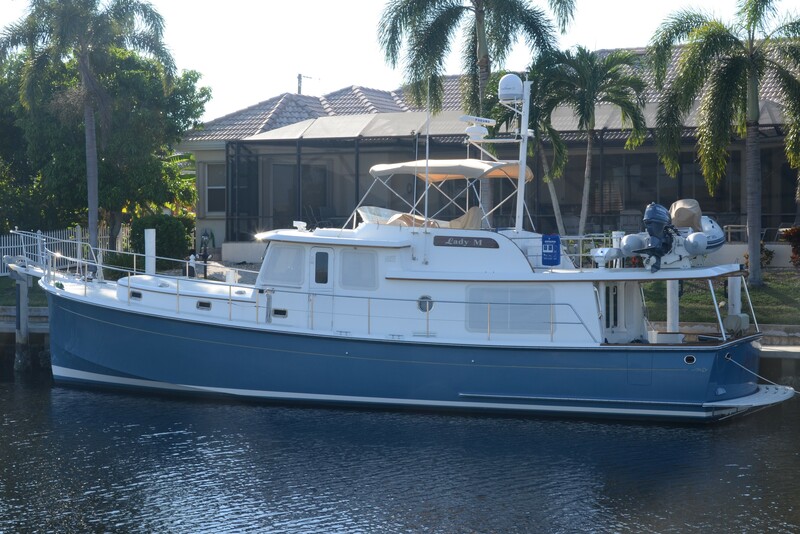 With stunning Stars and Stripes Blue hullsides, possibly the best color on a Krogen Express, a fresh detail to her topsides, countless upgrades, and an updated engine package (to the newer 480 Yanmars) to keep her current, this distinctive pilothouse motoryacht will carry you in style to the destinations of your dreams. 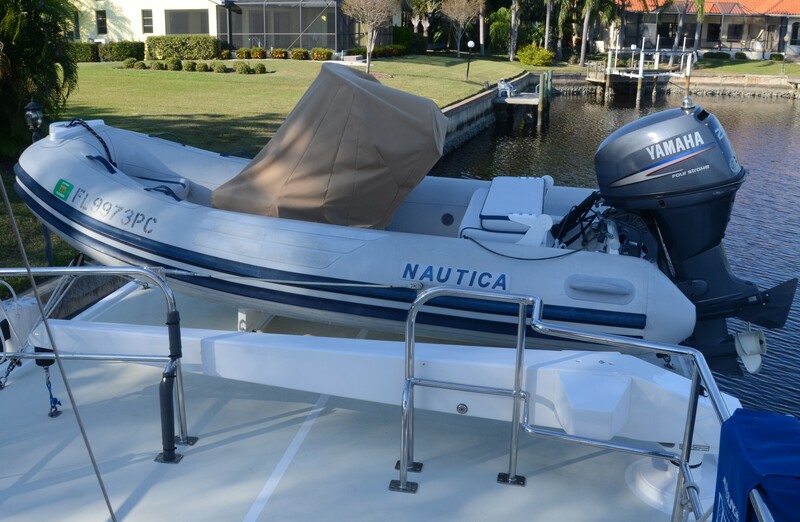 Stabilized, beautifully appointed, and equipped with an extraordinary electronics package, she’s turn key and absolutely cruise ready. 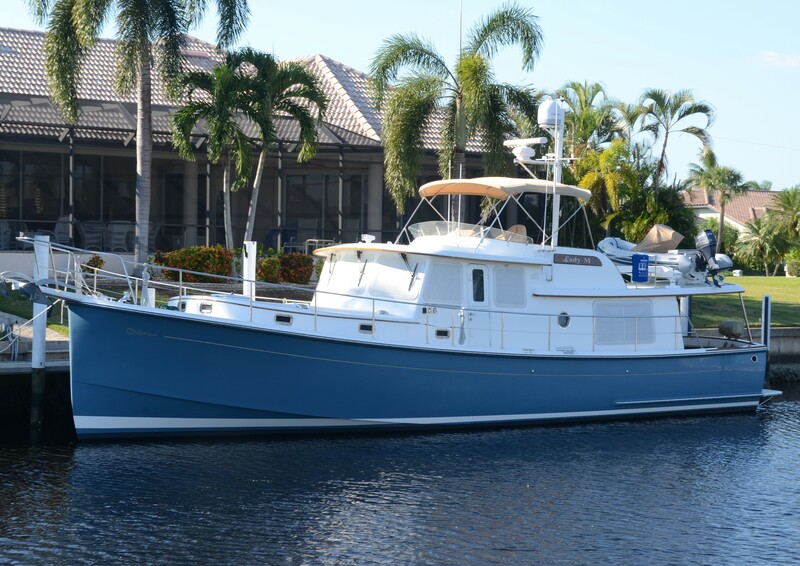 Enjoy the Krogen Express at efficient trawler speeds or take advantage of her semi-displacement hull to run in the mid to upper teens. Call Bob Loudon today at 404.786.4514 to schedule a personal showing. 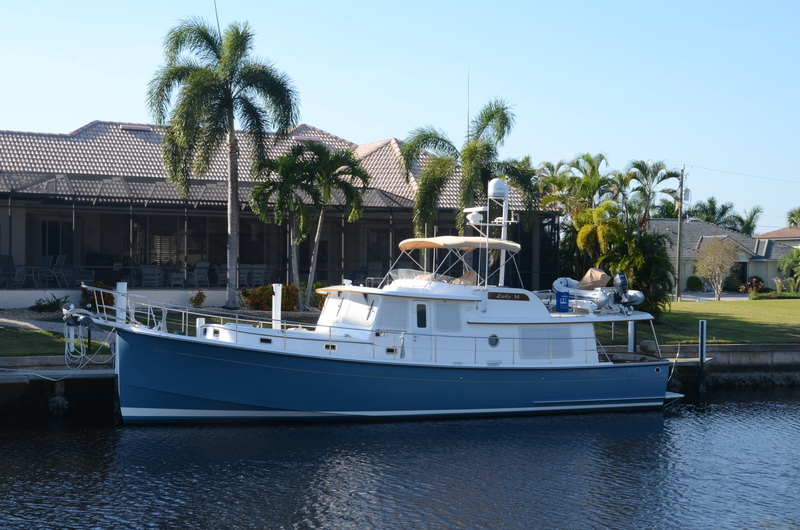 Designed by James Krogen, the KE52 combines classic, timeless style with exceptional seakeeping and efficiency. 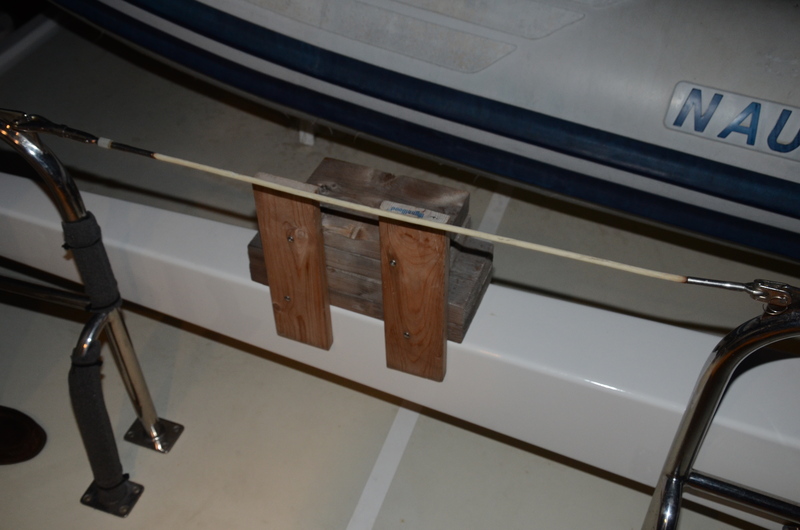 Her plumb stem, raised bow, and broad beam forward allow her to slice through the waves with ease while providing surprising space in her accommodations. 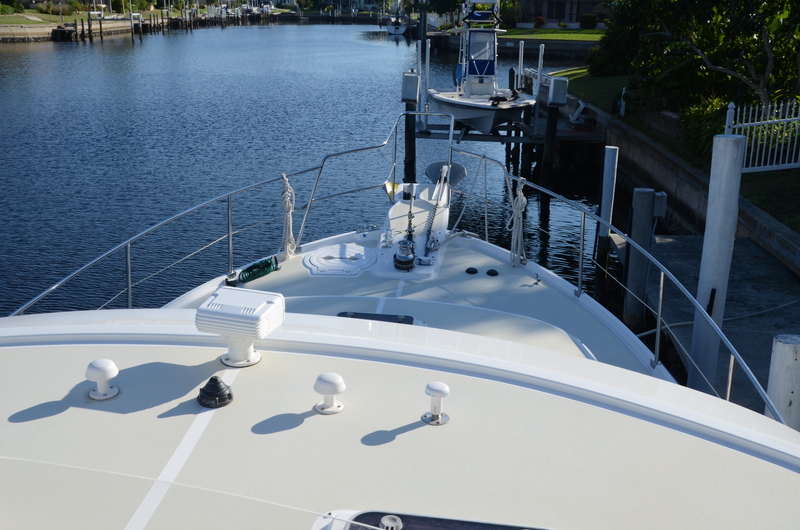 Her low profile allows her to get under bridges as low as 15′ and with a draft of just 4′, she’ll take you places most 50 footers won’t. 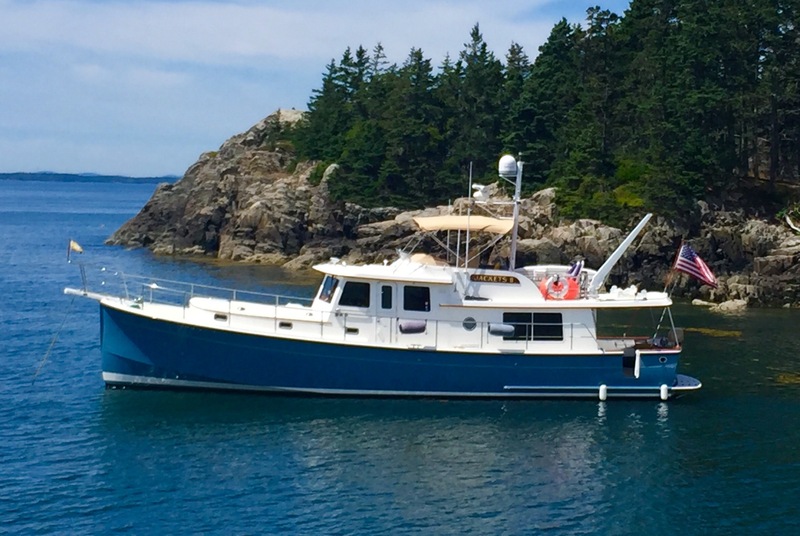 Her semi-displacement hull delivers trawler efficiency at displacement speeds with true cruise capabilities in the mid-to-upper teens. 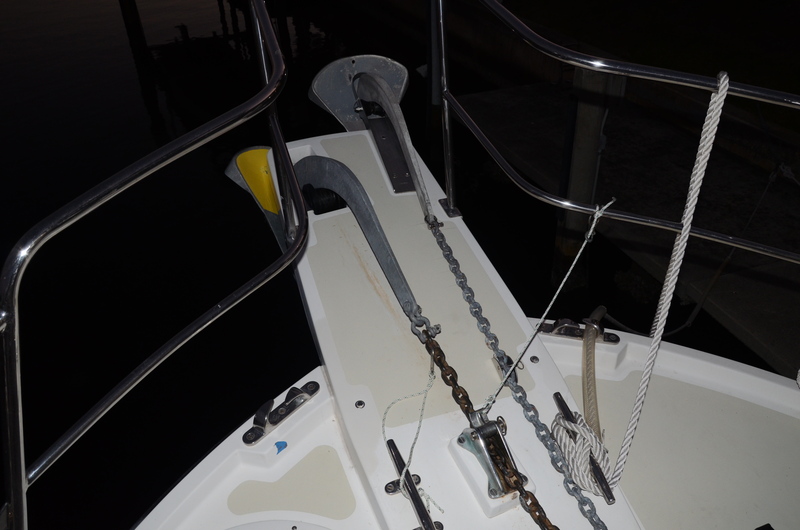 And her generous keel provides stability and protection for her twin 26×26 propellers. 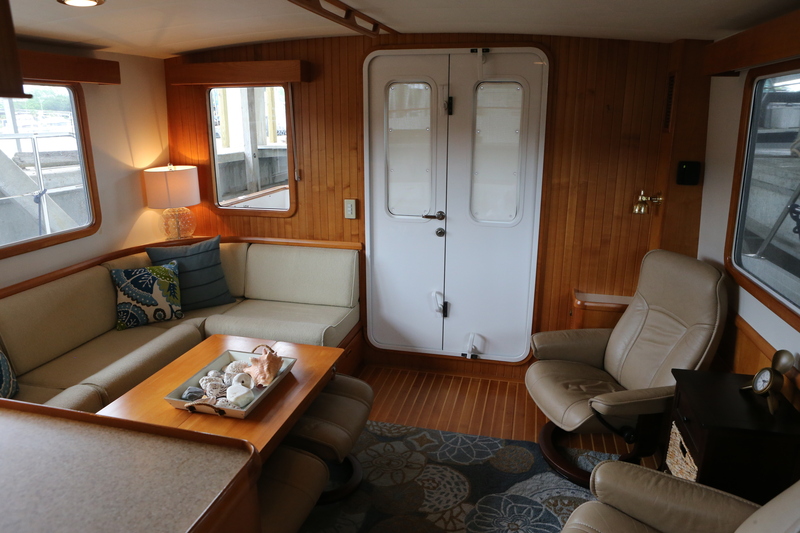 Boarding a Krogen Express couldn’t be easier with a large transom door and wide boarding gates on either side of the spacious, covered cockpit. 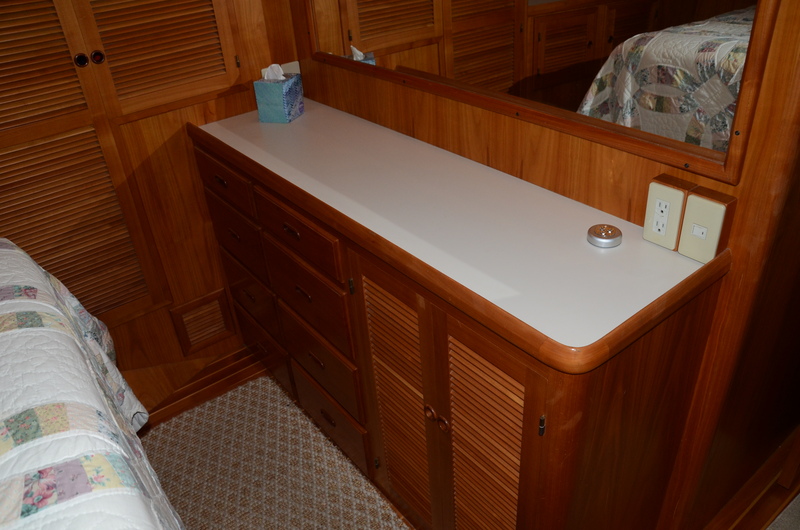 Ample storage for lines, fenders, cleaning supplies, and more is provided by the cavernous lazarette below. Entering the salon through double, watertight aluminum doors, her owners are treated to an inviting cherry wood interior. Along with her sumptuous joinery, old world craftsmanship is obvious with the quality of her appointments and overall fit and finish. 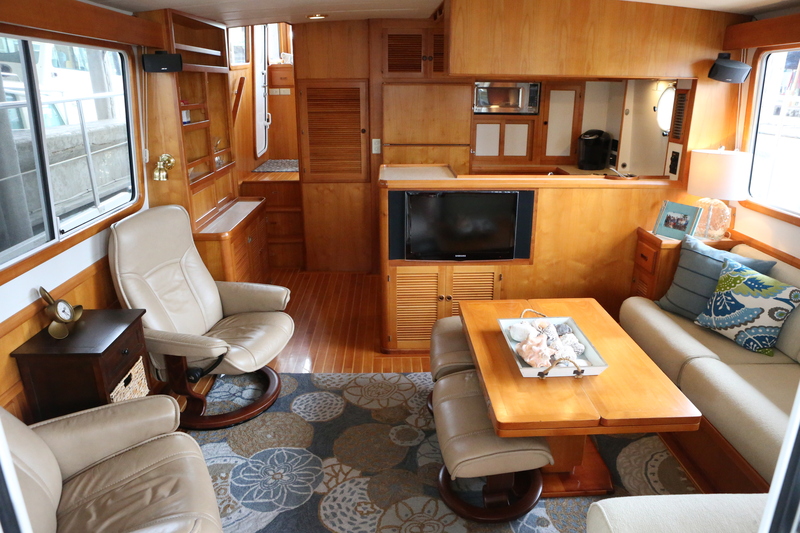 Legendary Krogen livability is evidenced by the large side windows and generous headroom along with the integral galley-up design. 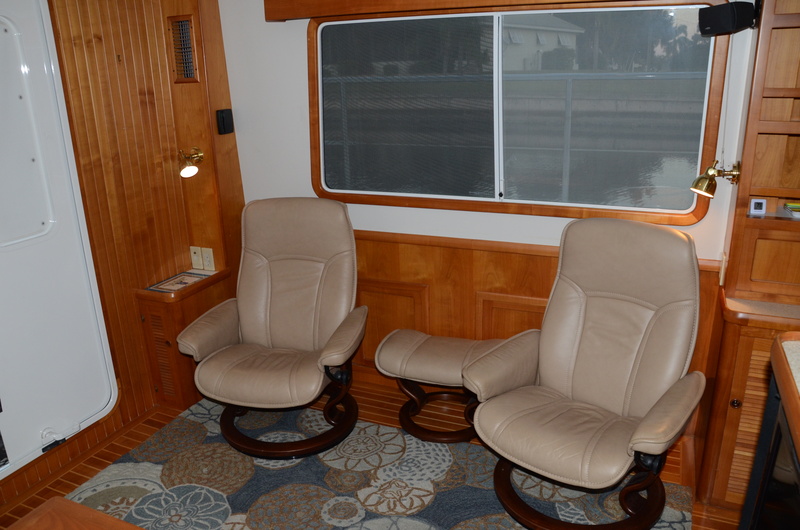 Inviting Stressless recliners to port and an L-settee to starboard are perfectly situated for enjoying the built-in 26″ Samsung LCD TV and Bose home theater system. 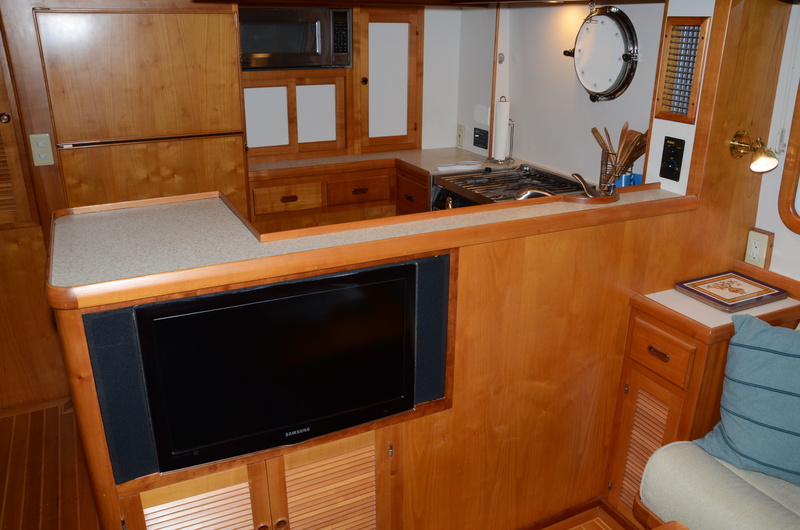 To port is generous additional underdeck storage and a built-in bookcase featuring fiddled shelves and still more lockers. 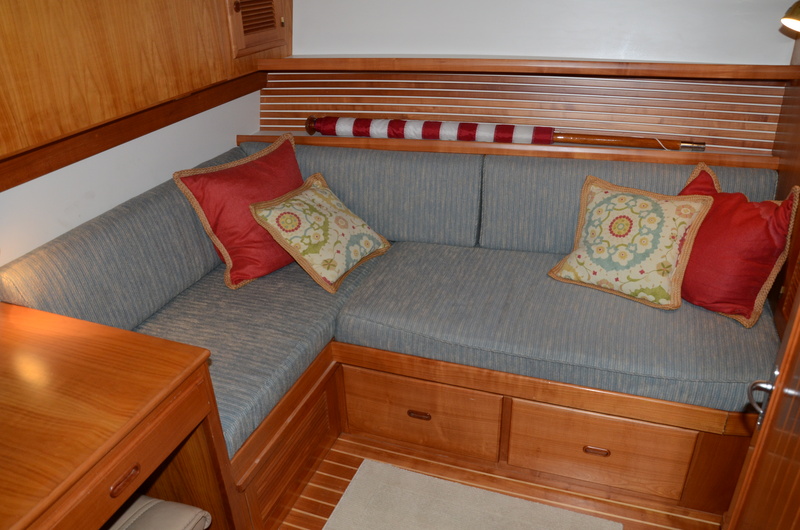 Located to starboard, the comfortable L-shaped settee has storage beneath and a nice end table forward. The hi-lo table has leaves that fold out for expanded seating capacity and can be moved outside for dining al fresco. The settee is covered in soothing, neutral fabric while Silhouette blinds provide privacy and protection from the sun. 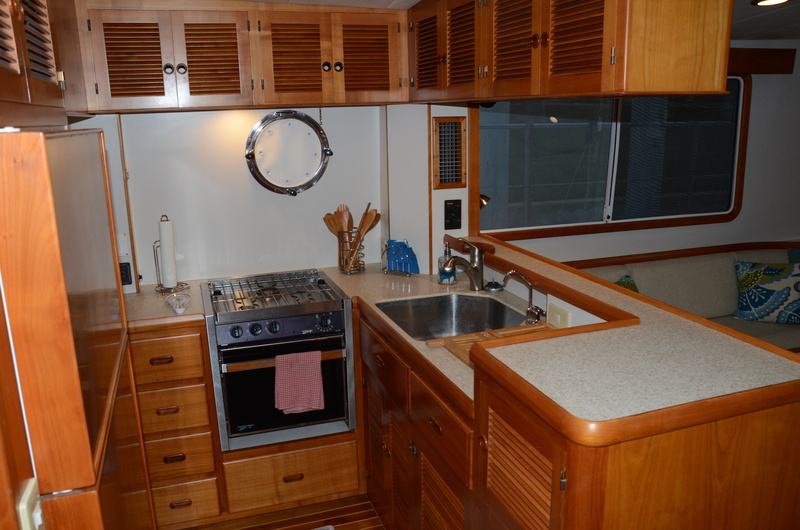 The gourmet galley is located up where her chef can always be part of the action. 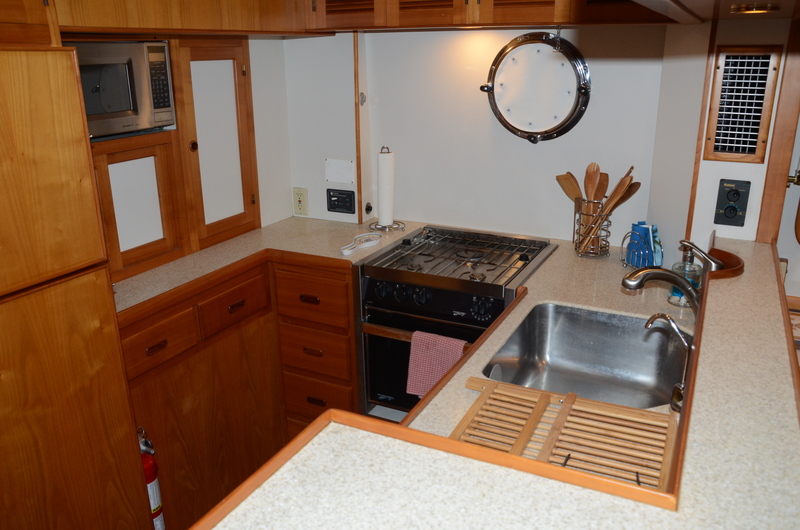 She’s well equipped for meal preparation with a 3-burner, Force 10 propane range, 14 cu. 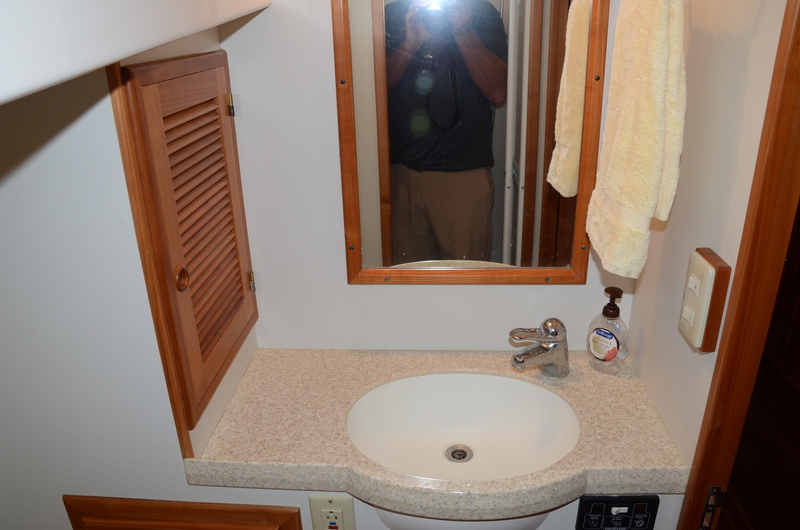 ft. refrigerator, GE microwave oven, and deep Elkay sink with pullout sprayer faucet. Neutral Corian counter tops are easy to maintain and will complement any decor, and the raised section is ideal for serving the crew. 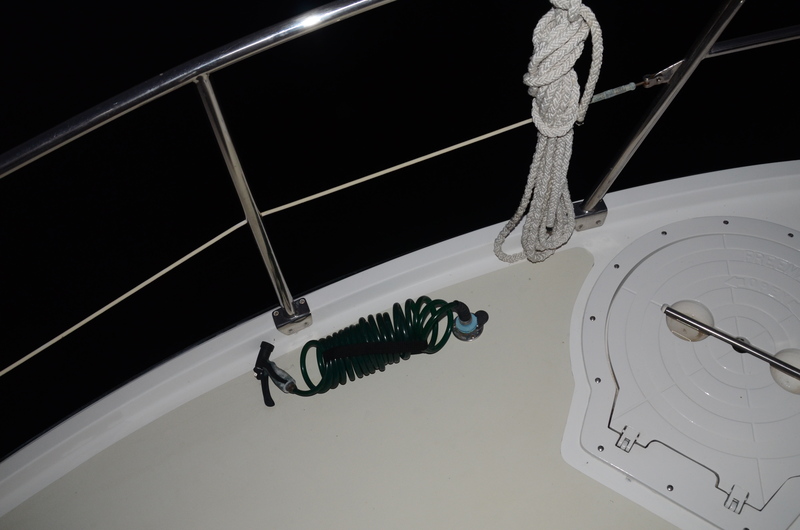 Traditional round port lights provides ventilation while abundant storage ensures a good home can be found for all provisions. Beneath the starboard side bookcase, the U-line ice maker frees up space in the ice box and ensures drinks will be well chilled. 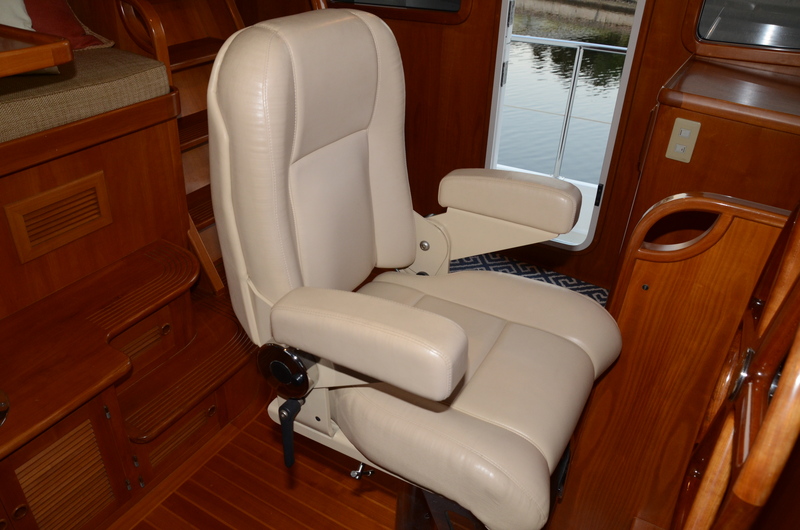 The centerline helm console in the raised pilothouse is equipped with a full complement of navigational electronics, all within easy reach of the fine Buff Ultraleather Stidd helm chair. 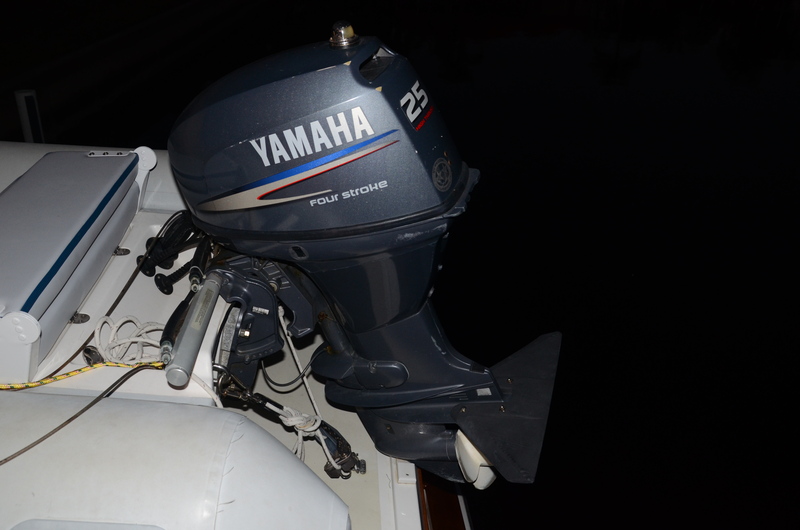 Precise Teleflex Morse controls allow smooth control of the twin nearly new 480hp Yanmars while her rudders are guided by a custom, handcrafted cherry helm wheel. 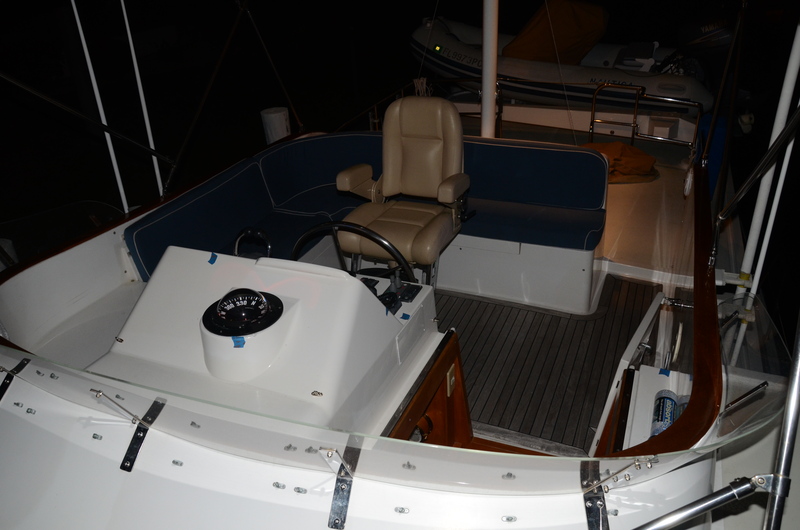 Top of the line electronics occupy the helm. 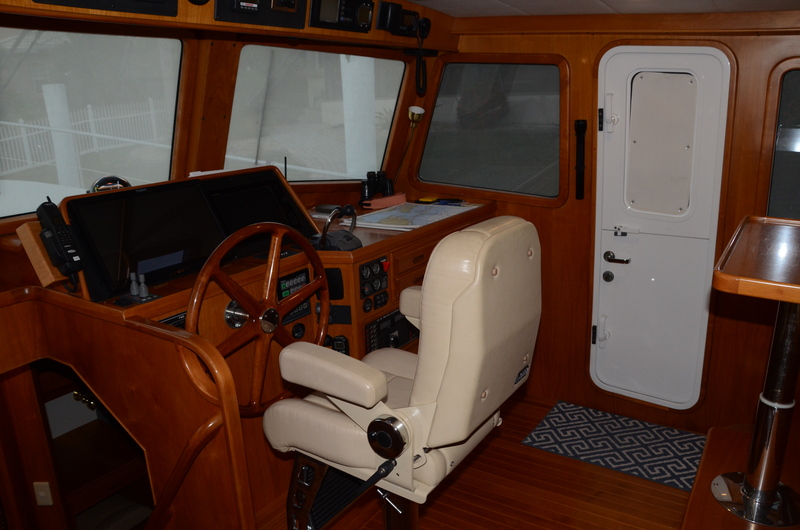 A current Furuno Navnet 14″ color radar chartplotter, just factory reconditioned, is integrated with the Simrad AP21 autopilot while a huge 24″ Planar touchscreen monitor connected to the flybridge chartplotter provides redundancy. 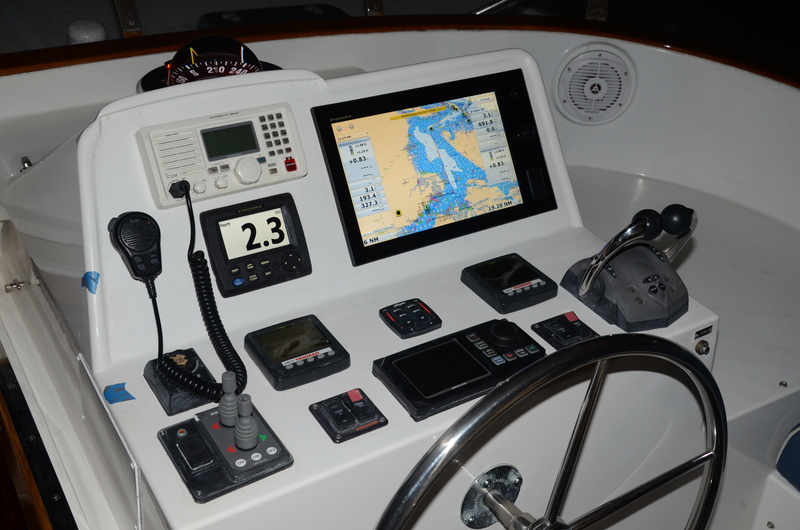 Two dedicated depth displays offer redundancy while an Icom M504A VHF radio ensures good communication when required. 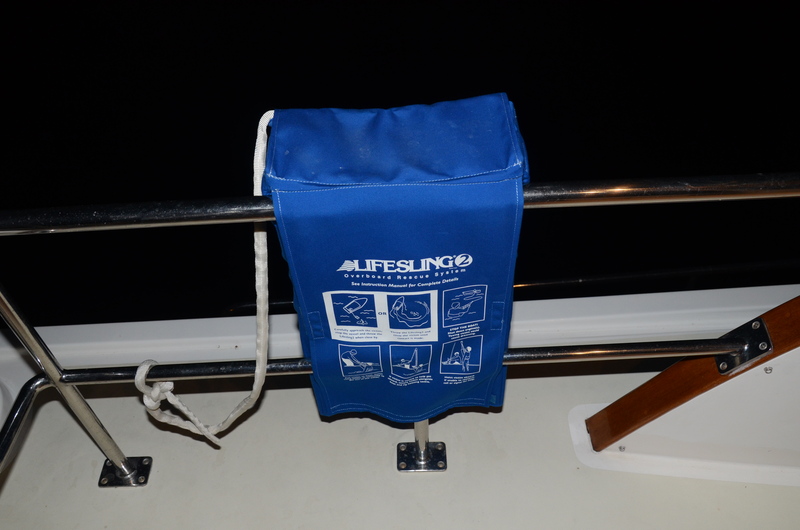 The Furuno FA50 AIS completes the comprehensive electronics package. 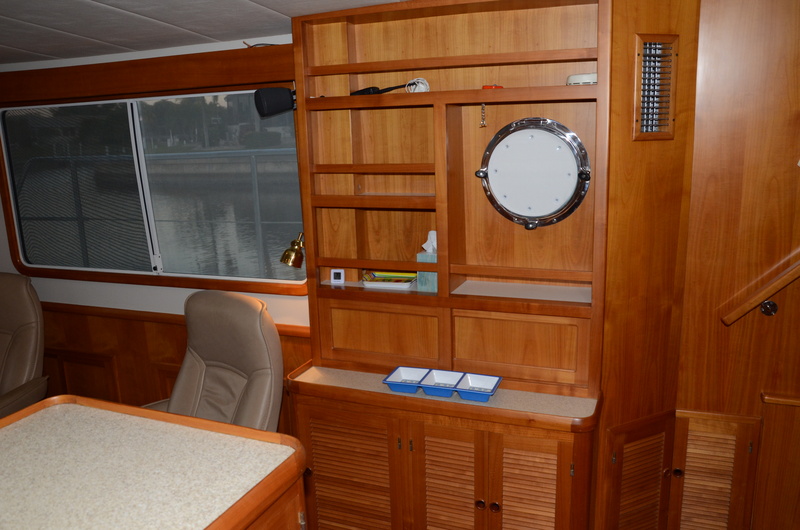 Two large chart drawers and a wide, lighted table to starboard allow for easy storage and use of paper charts. 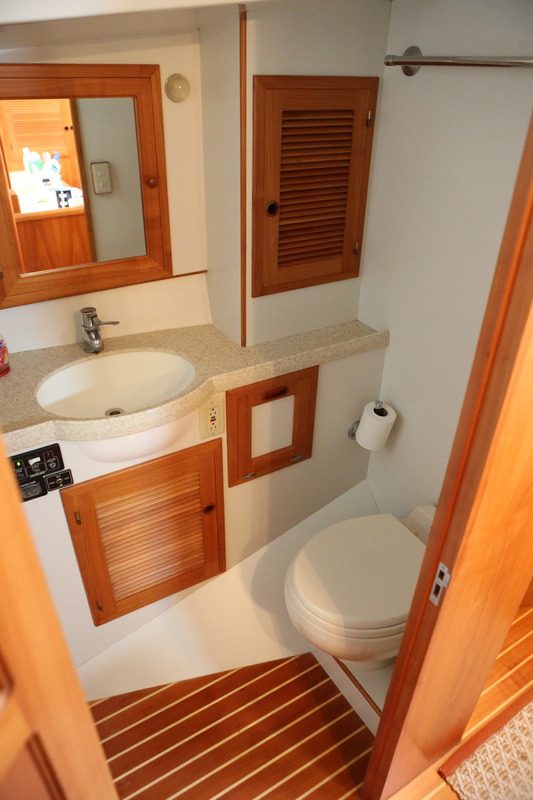 An ABT bow thruster and Side Power stern thruster assure comfortable close quarters handling. 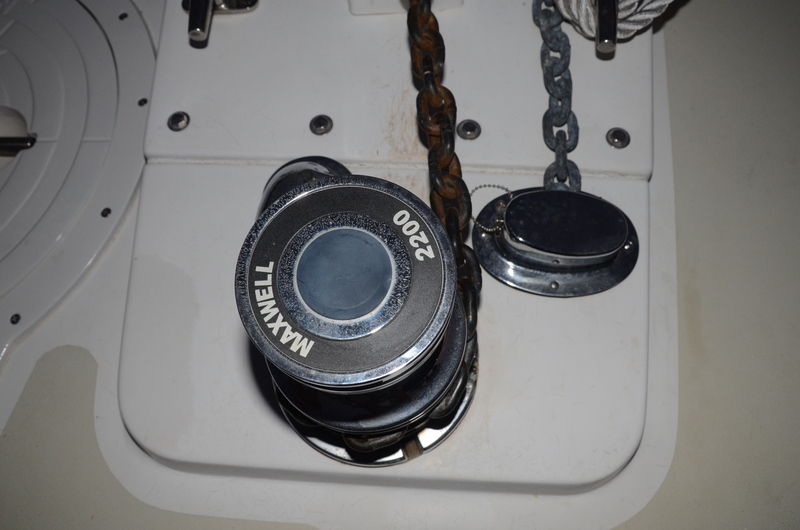 Controls for the dual trumpet Kahlenberg horns, intermittent Exalto wiper/washer system, Maxwell windlass (just rebuilt), and updated Bennett trim tabs are all close at hand. 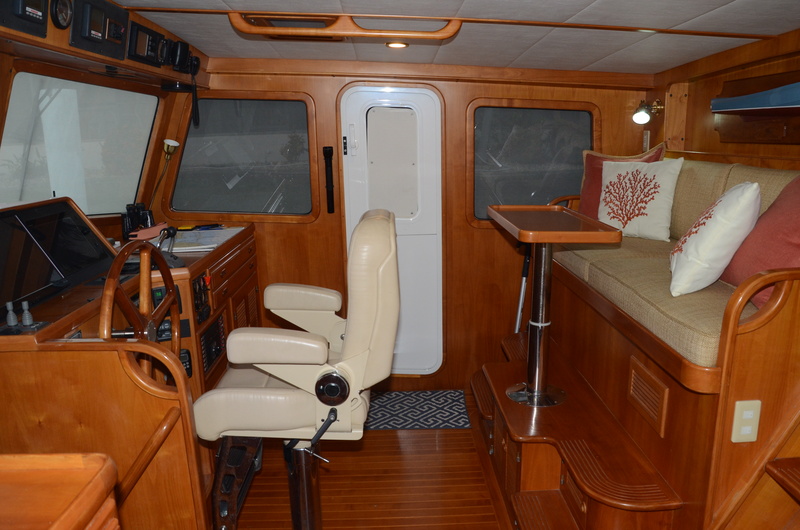 The pilothouse watch berth is elevated for optimal forward visibility, long enough for naps underway, and converts to a 3/4 double berth to accommodate overnight guests. 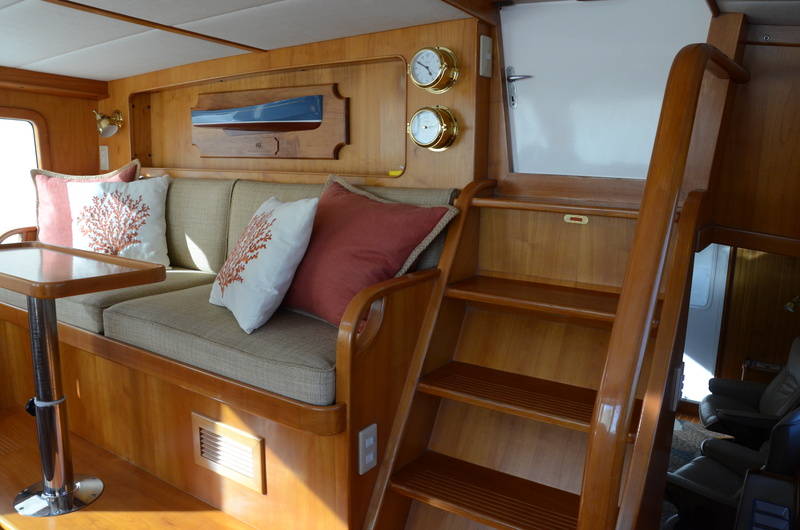 A table provides a convenient work surface and the wall mounted lamp to starboard makes this an ideal location to retire with a good book. 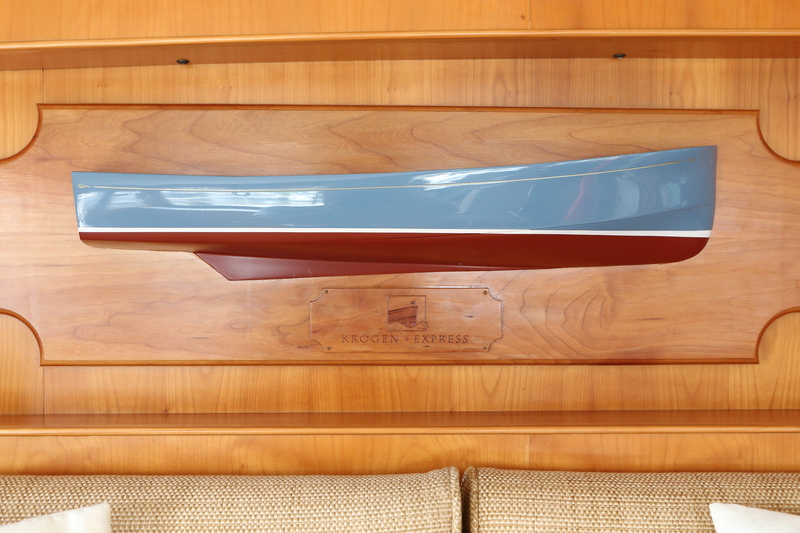 Above the settee, a color coordinated half hull model showcases her elegant lines and makes for interesting conversation. 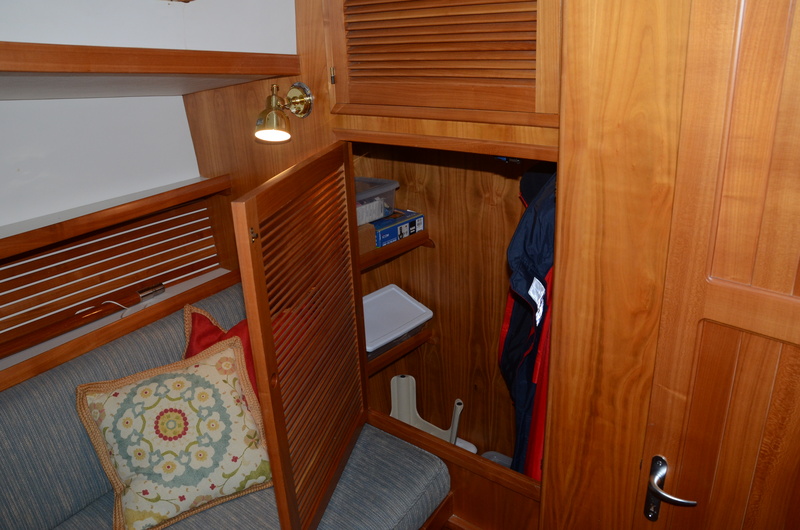 Beneath the settee are several small lockers for equipment storage. 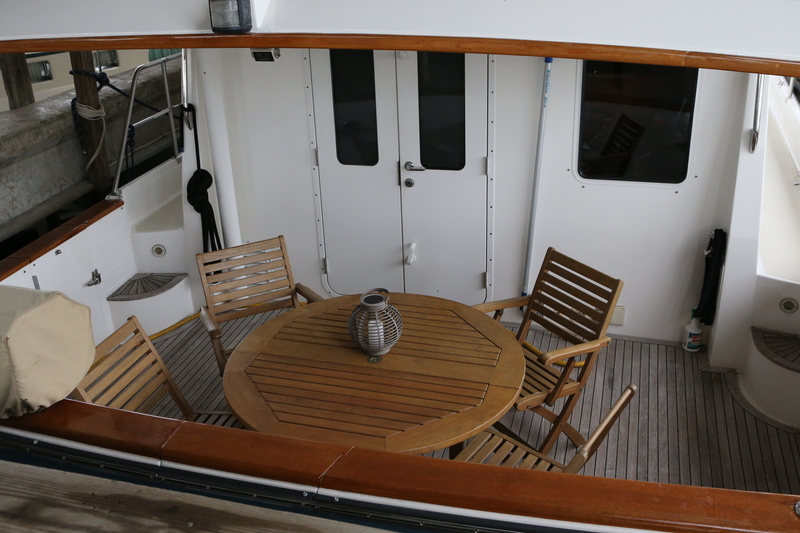 High quality, weathertight Dutch doors lead directly to the wide side decks while stairs to the port side of the settee provide easy access to the flybridge. 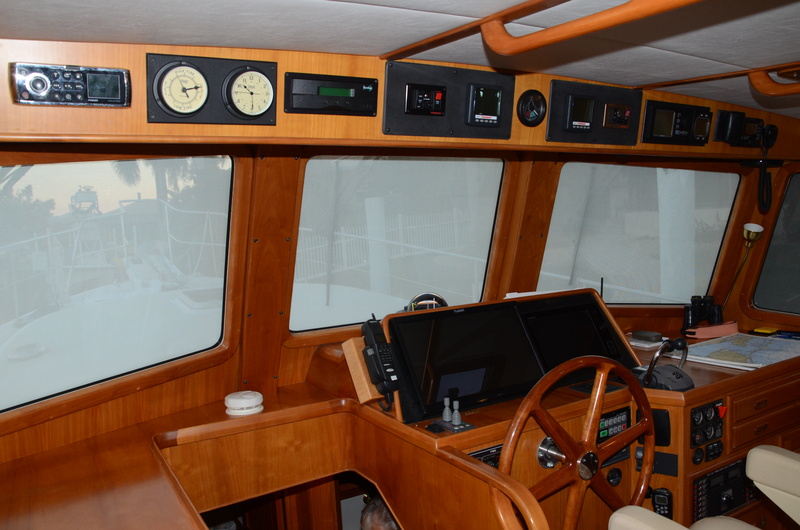 Textilene screens for all pilothouse windows provide sun protection. 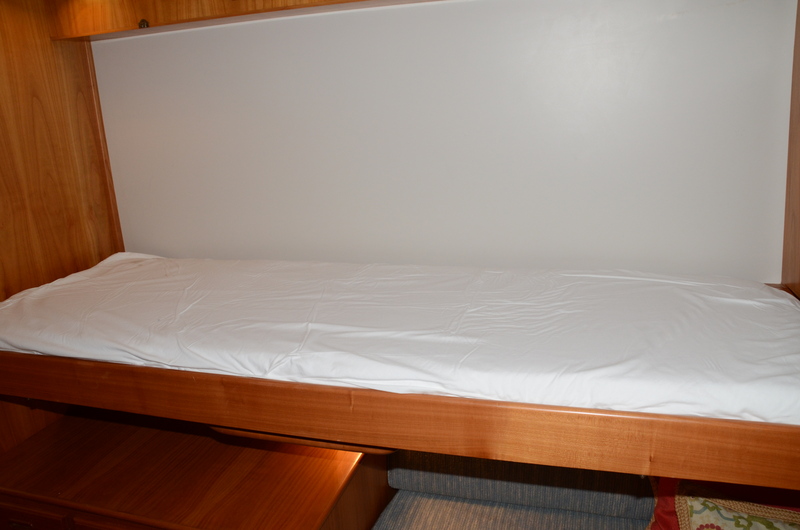 An L-settee that converts to a double berth highlights the flexible nature of the guest stateroom, while the Pullman berth provides additional sleeping capacity. 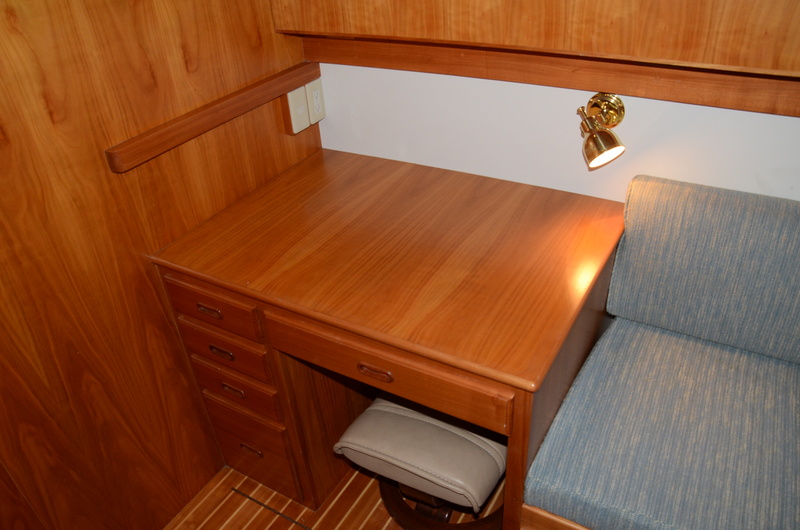 Located inboard is a large desk with drawers. 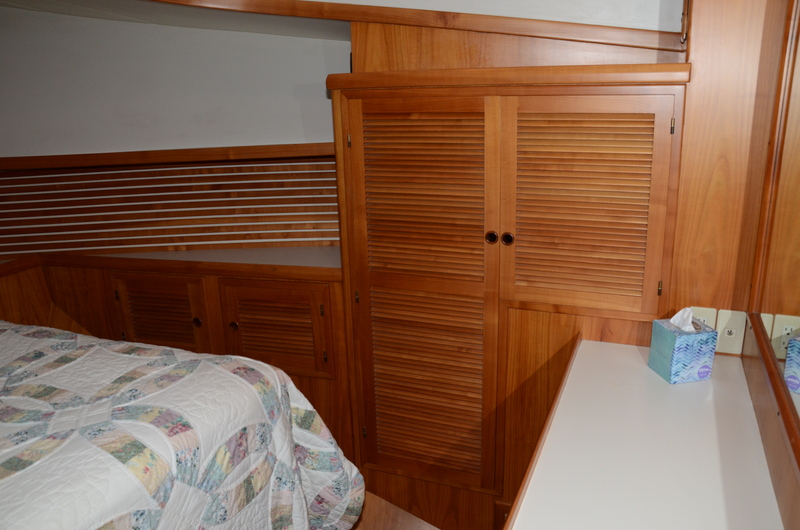 A deep hanging locker and huge drawers under the settee provide ample storage. 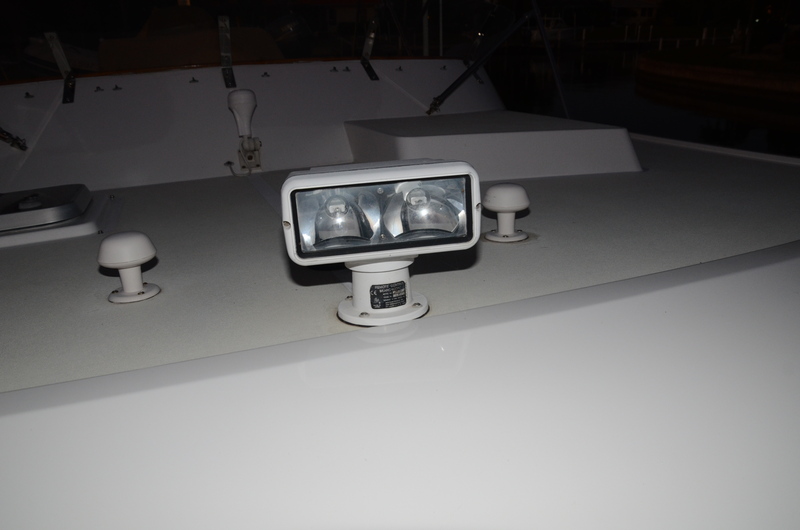 Two port lights and a screened hatch overhead make the GSR light and airy. 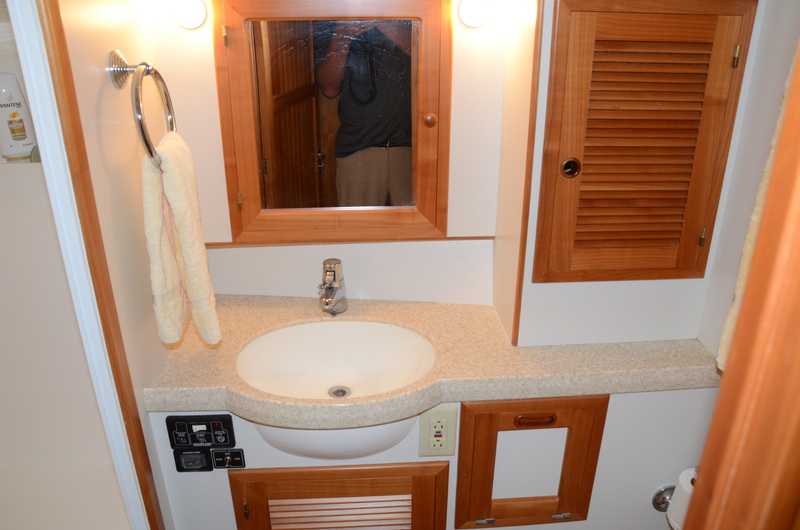 A full head is located across the companionway. 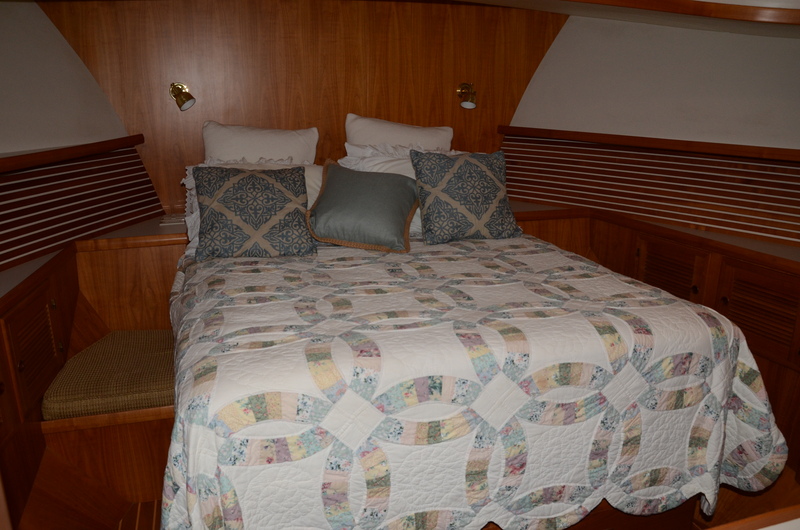 A true queen island berth is the centerpiece of the master stateroom. 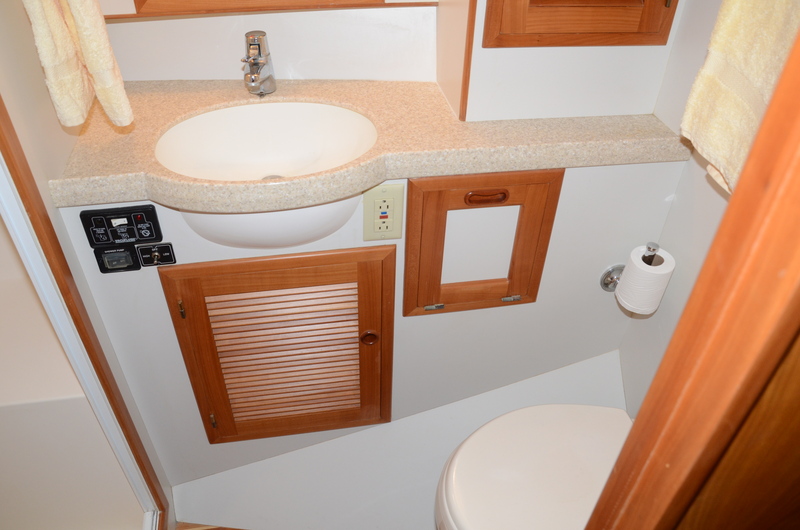 With over 7′ of headroom and light provided by 4 ports and a large screened deck hatch, the MSR feels surprisingly generous for a motoryacht this size. 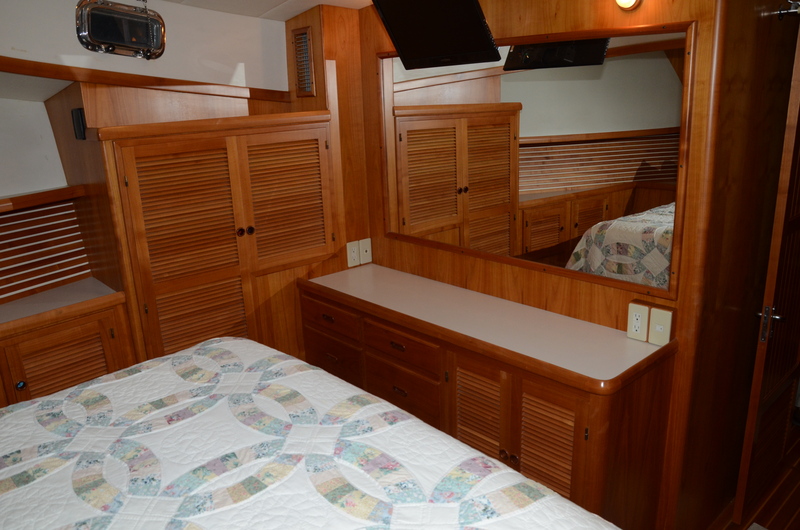 Hanging lockers on both sides, 6 deep drawers under the berth, and a dresser with drawers and shelved storage ensure her owners have ample room for their belongings. 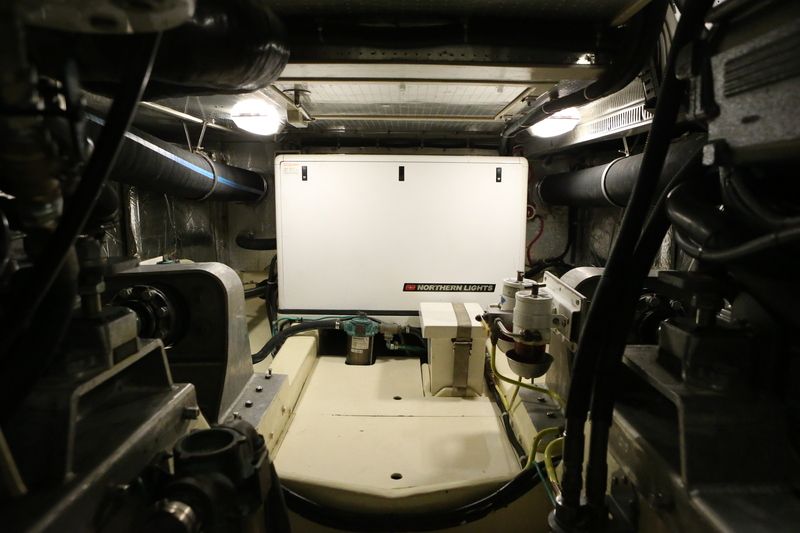 A look beneath the berth reveals cavernous storage and provides access to the dedicated battery bank for the bow thruster and windlass. 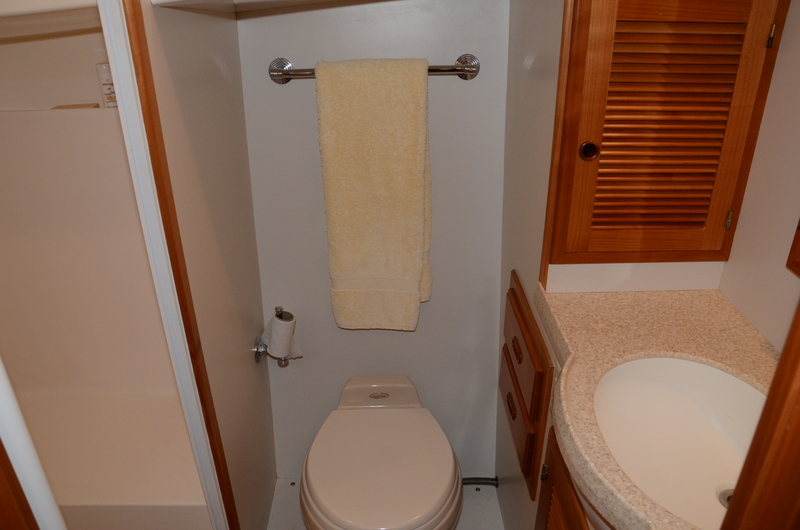 The ensuite head features a molded fiberglass shower stall with a seat, Vacuflush head, and Corian countertops. 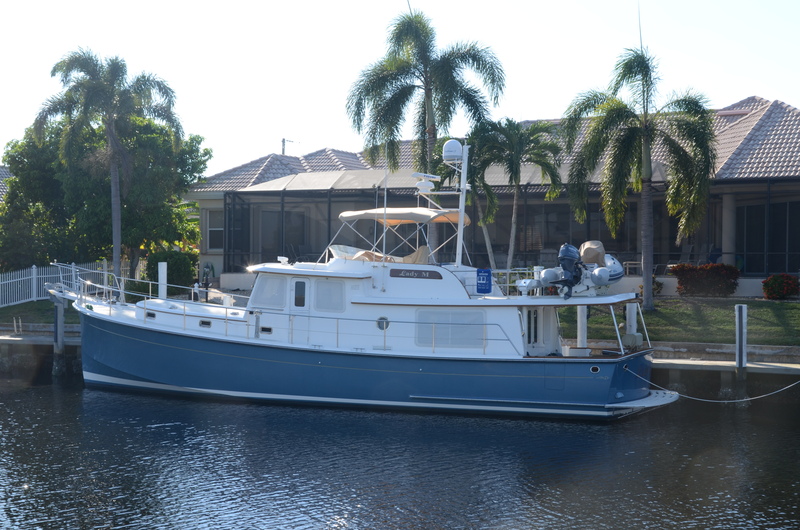 While her pilothouse is fully capable, most Krogen Express owners prefer operating their vessels up top where they can better experience her cruising capabilities. Conversations are easy as little engine noise makes its way up here, leaving only the soothing sounds of sea breezes and ocean waves with which to compete. 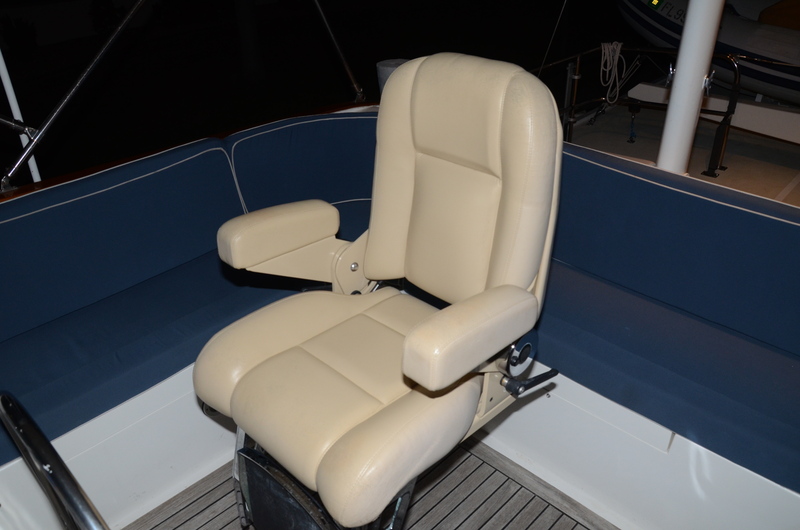 A frameless venturi windscreen deflects air above the captain sitting in the comfortable, raised centerline Stidd helm chair. 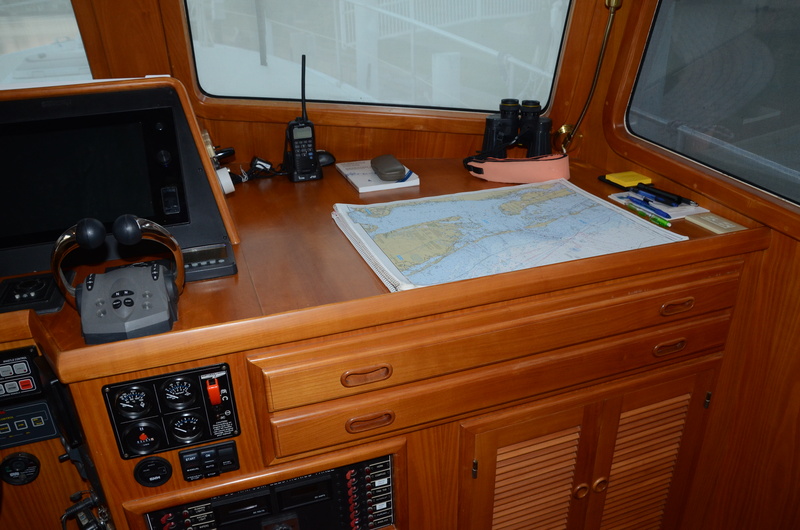 An excellent Furuno Navnet TZT 14″ radar chartplotter, just factory refurbished, provides navigational support along with the large Danforth compass. 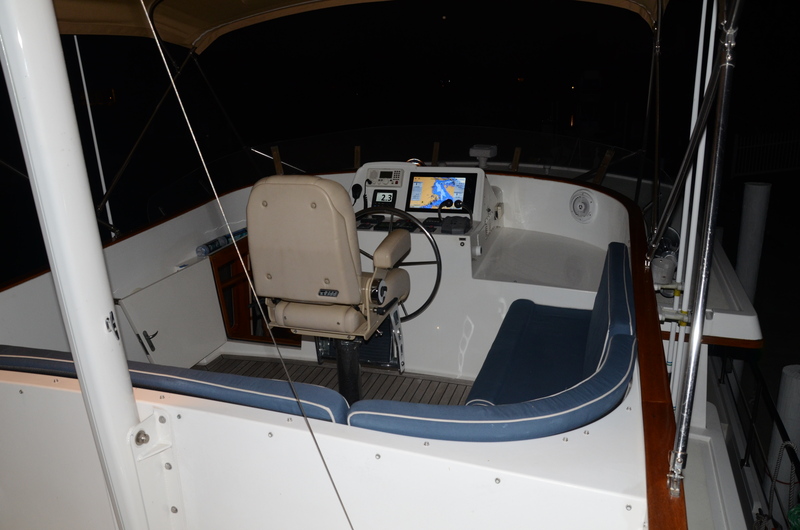 The Simrad AP20 autopilot provides the steering. An ICOM M602 VHF radio provides communications. 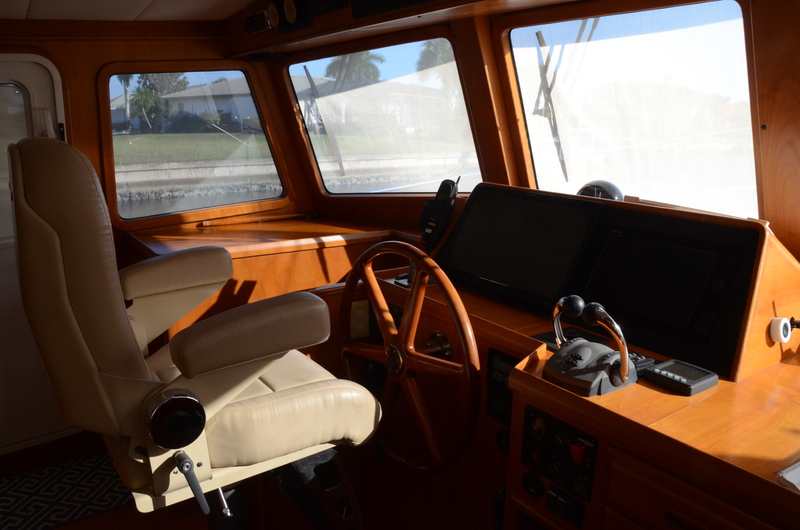 Controls for the bow and stern thrusters, trim tabs, and windlass are close at hand. 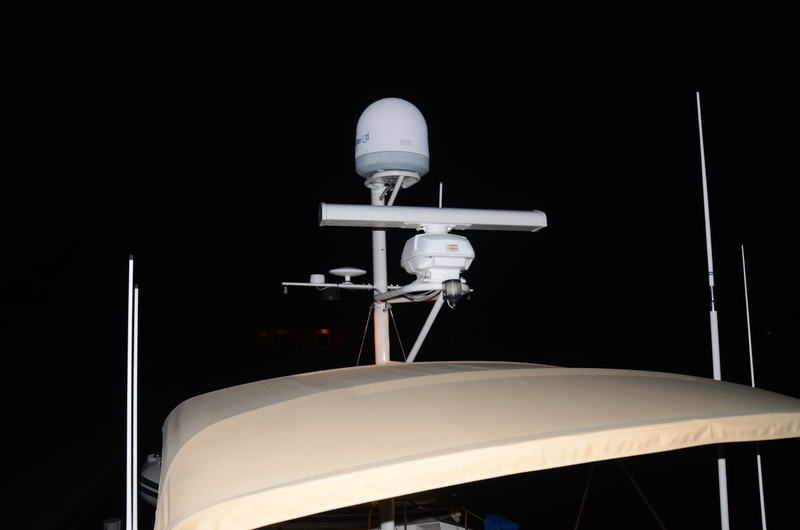 The 4′ HD radar scanner and satellite TV dome are mounted on an aluminum spar-style mast, freshly painted, that can be lowered when needed. 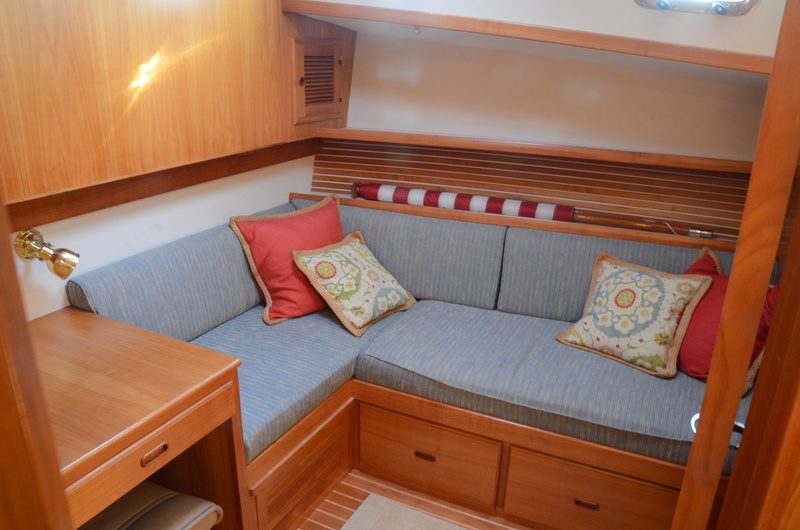 Shaded by a beige Sunbrella bimini top, the L-settee with newly upholstered Ultraleather white cushions provides ample seating for crew and guests and contains storage beneath for the extensive canvas package. 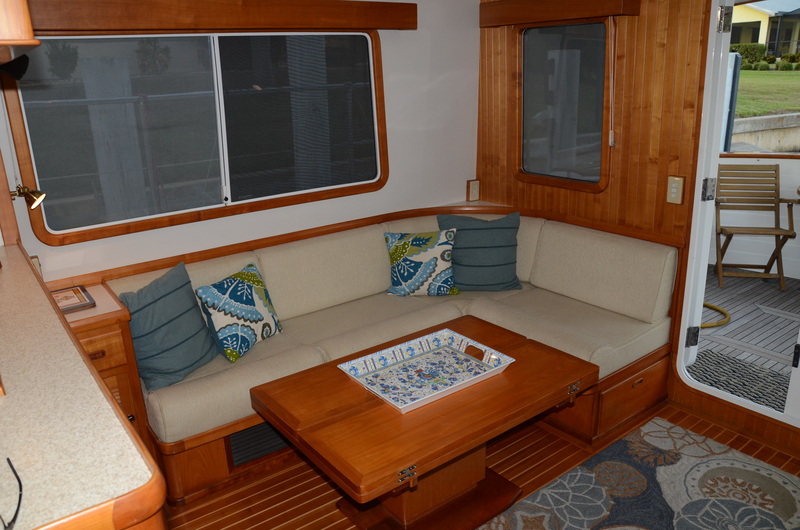 Situated aft of the settee, the open boat deck easily accommodates two folding deck chairs and serves as access to the 11′ Nautica 4-seat luxury tender. 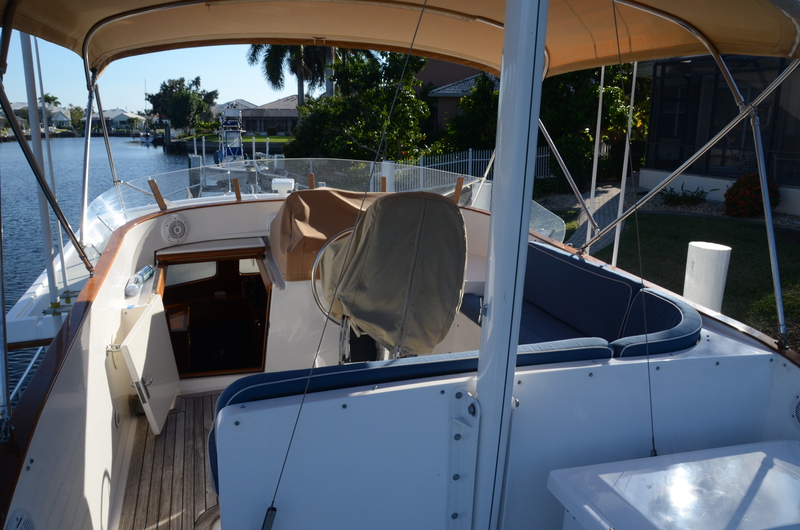 This is the ideal place to enjoy a cup of morning coffee or catch a beautiful evening sunset. 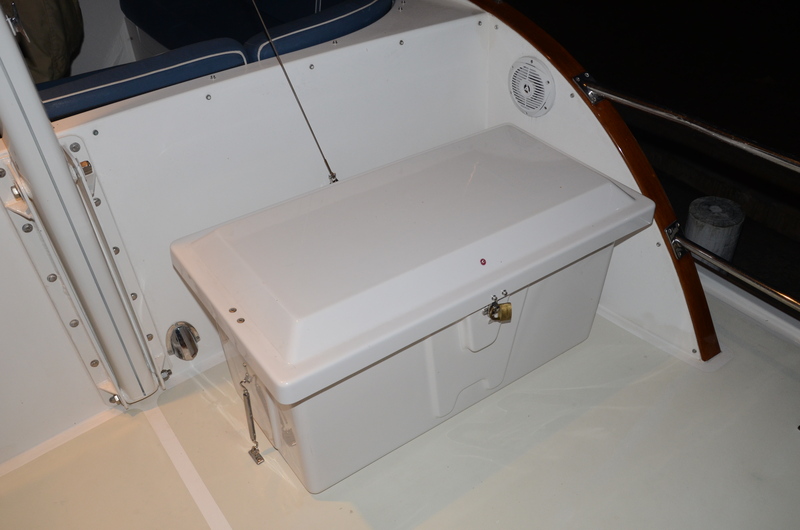 The dinghy, with a raised console and seating for 4, is powered by a 25 hp 4-stroke Yamaha outboard and launched with the Nautical Structures davit. 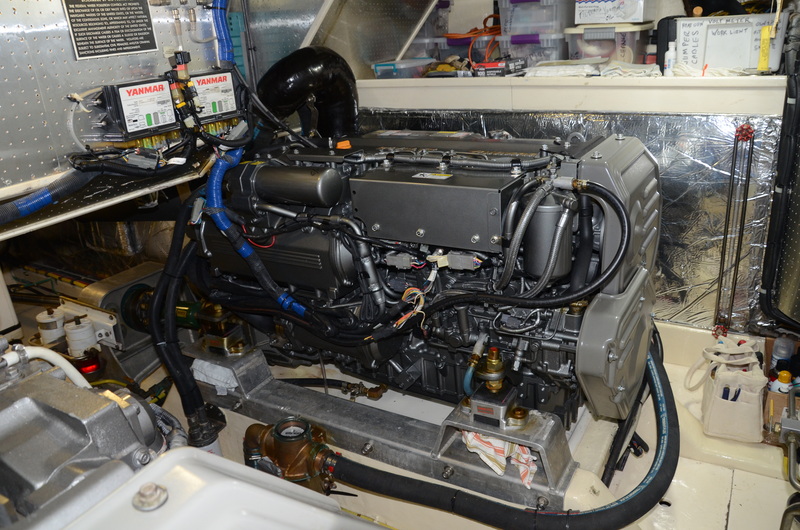 An exceptional stand up engine room houses a pair of powerful 480 hp electronic Yanmar diesels which can be easily accessed all around. 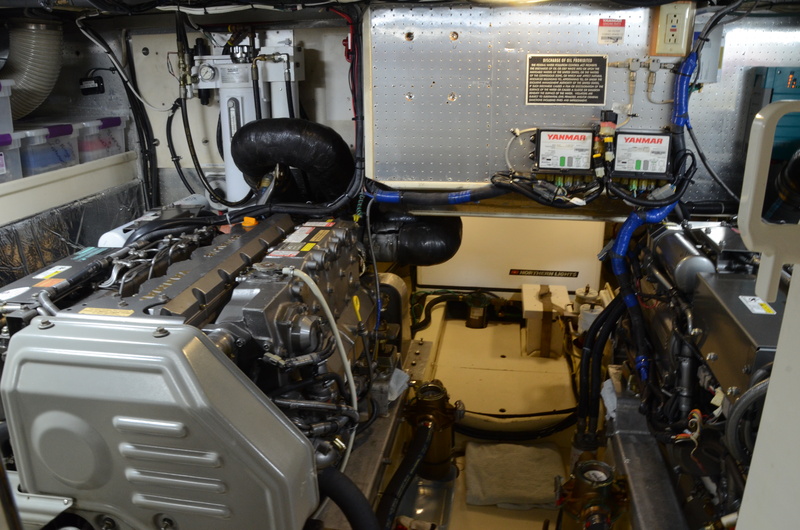 The engines are fired by dedicated starting batteries and drive through matched ZF transmissions. 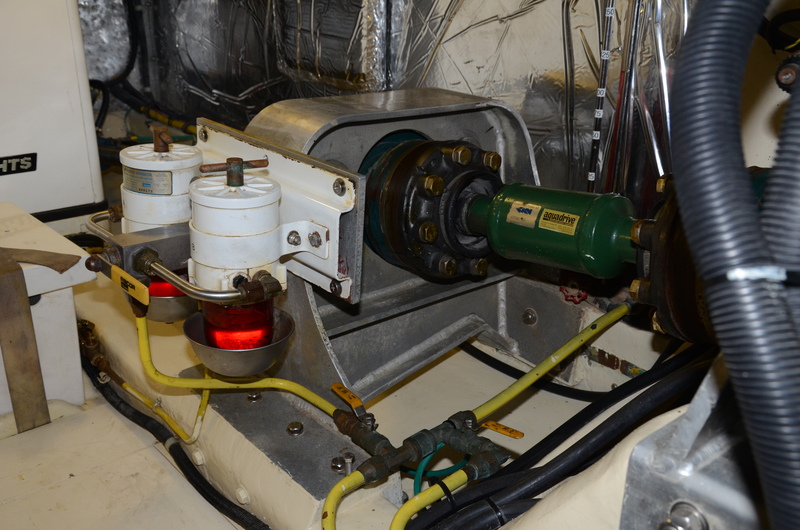 Vibration is kept to a minimum with the standard Aqua Drive systems. 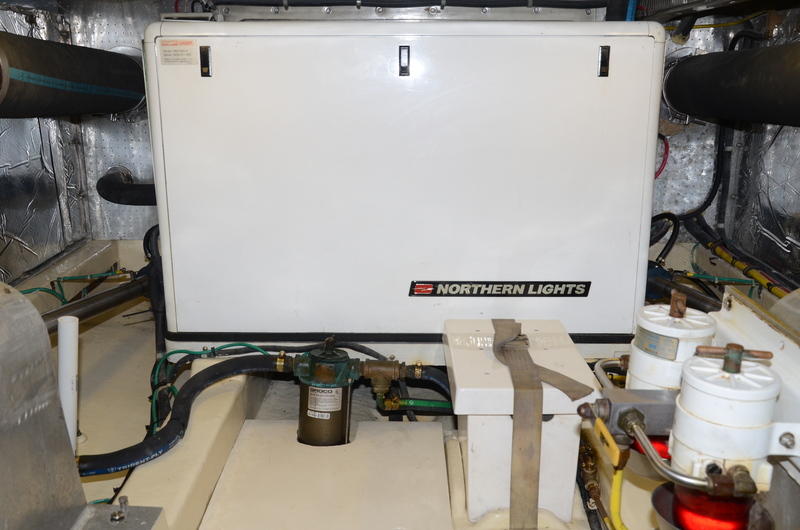 The 12kw Northern Lights genset, just extensively serviced, sits on the centerline and has its own starting battery, isolated from the others to ensure she starts every time. 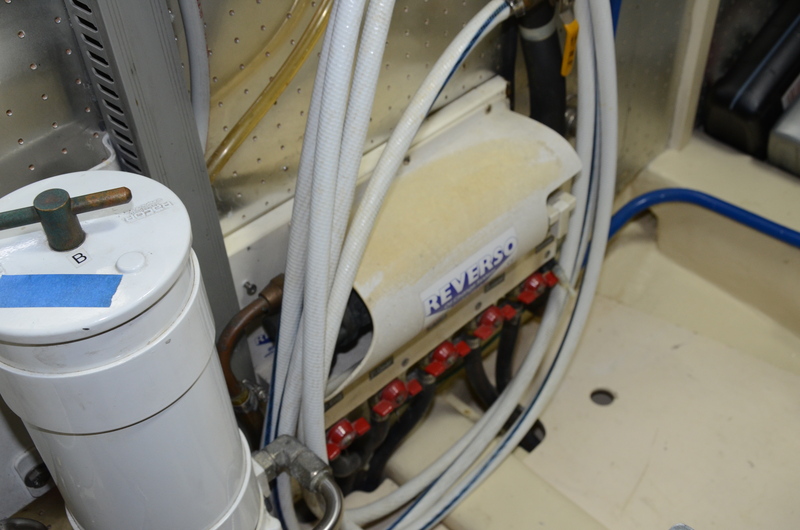 A Reverso fluid changing system is connected to both engines, both transmissions, and the genset to improve serviceability, while a fuel transfer pump makes equalizing the tanks a breeze. 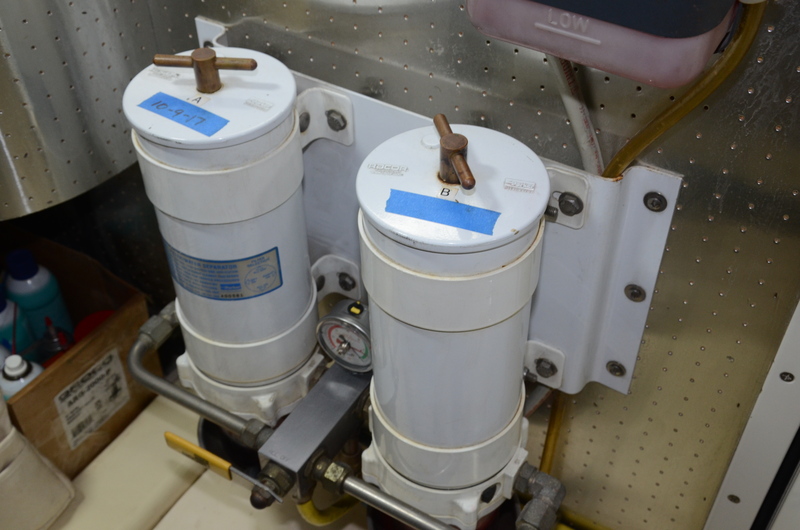 As with the water tanks, diesel fuel levels can be easily assessed with convenient sight tubes. 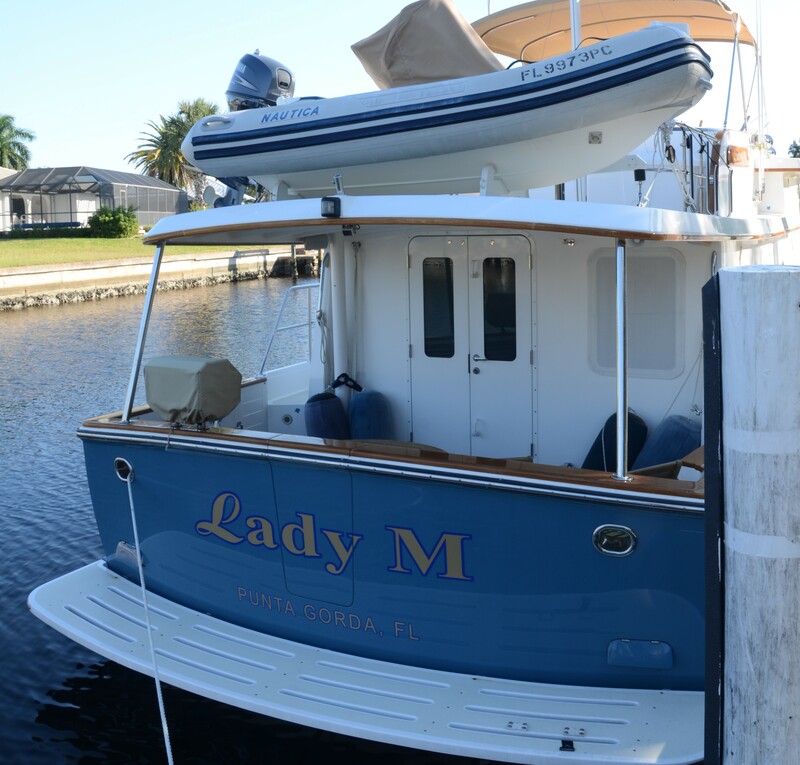 An automatic fire suppression system, freshwater washdown, and storage for tools and supplies above and alongside the water tanks are additional features welcomed by her owners. 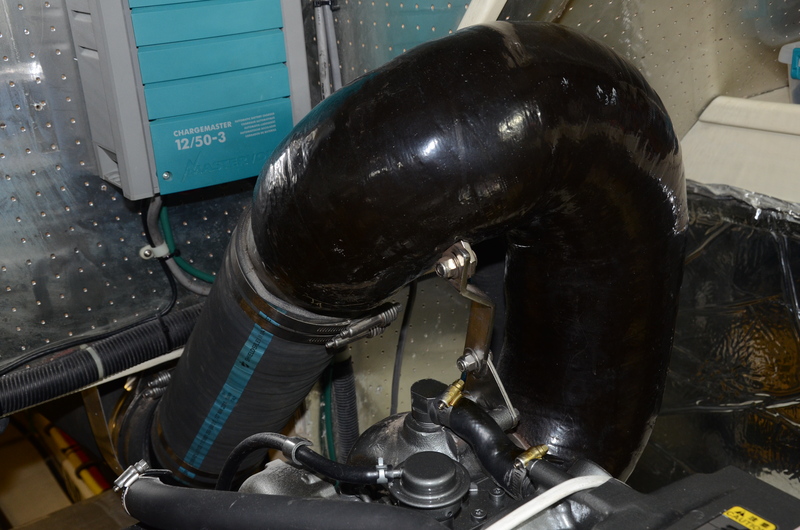 Located in a separate spacious bilge area, away from the heat of the engine room, are the three brand new CruiseAir reverse-cycle A/C systems. 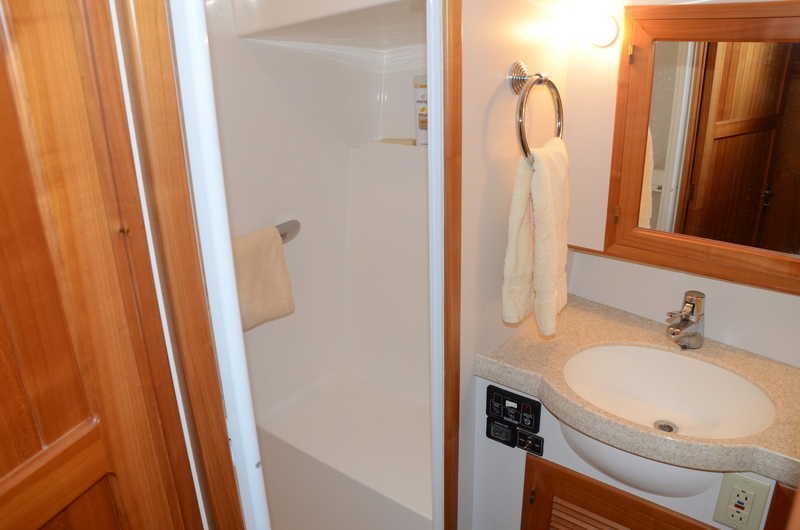 In the same compartment is a new 20-gallon Torrid hot water heater which is supplemented with heat from the main engines. 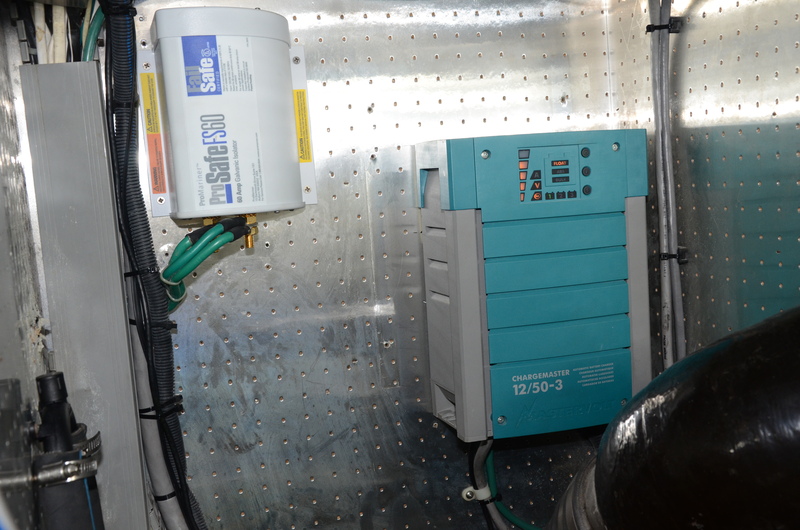 Beneath the salon, a Mastervolt 4kw inverter/200a charger, 1200 Ah house battery bank, 5 kw auxiliary NextGen genset, and Cablemaster drum storage are also easily accessed. 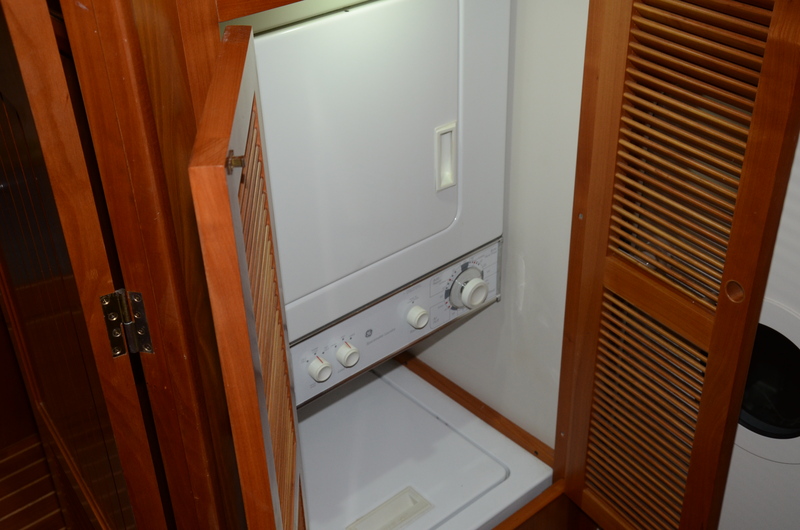 GE stacked washer/dryer. 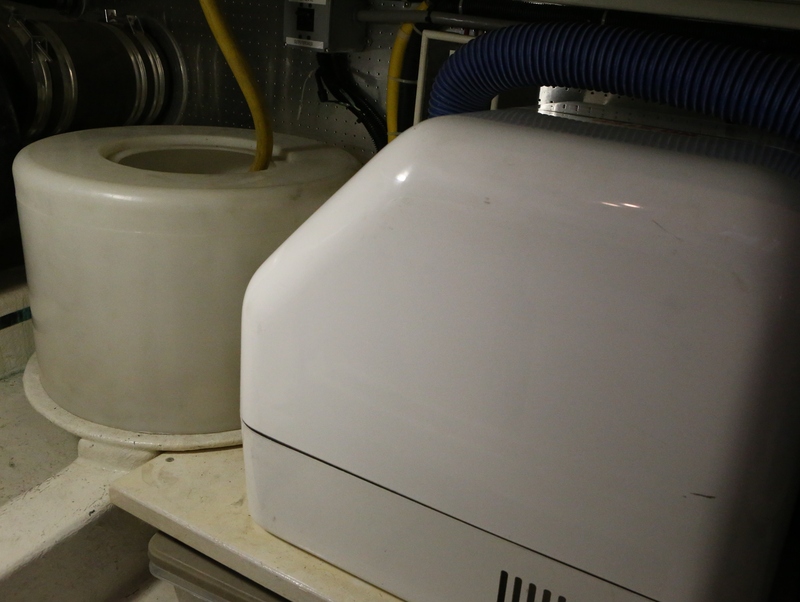 Dryer is 220V and vented.